Pioneer Computers Australia recently introduced a new powerful DreamBook notebook ,named DreamBook Power X72.The new DreamBook Power X72 notebook features Six-Core CPU and is based on Intel's new Calpella platform.The notebook comes pre-intalled with Windows 7 OS. 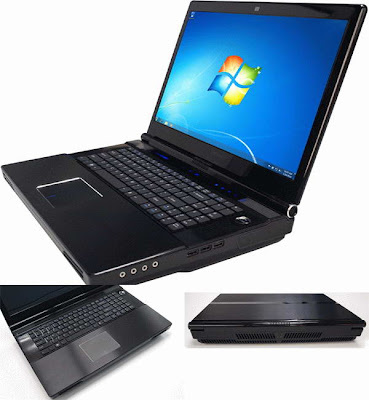 DreamBook Power X72 Notebook equips a a 17.3-inch display with Full HD resolution of 1920×1080 pixels and is powered with a 3.33GHz Intel Core i7-980X Extreme Edition six core processor.The new powerful DreamBook houses two nVidia GeForce GTX 480M GPU with 1GB of video memory each. DreamBook Power X72 Notebook supports up to 12GB of DDR3 RAM module and up to three HDD with total capacity of 3TB and is available with optional SSD drive. New DreamBook Power X72 Notebook Features 3MP camera, card reader, Wi-Fi, HDMI, Dolby Home Theatre, TV tuner, fingerprint reader, DVD writer or Blu-ray drive and optional Bluetooth.The notebook weighs 5.3kg and its dimensions are 419×286x56.6-60.7 mm. The all new New DreamBook Power X72 Notebook comes with a price tag of around $4,000. Tags:-17.3-inch notebook, DreamBook Power X72, DreamBook Power X72 Notebook features, DreamBook Power X72 Notebook specifications, DreamBook Power X72 Notebook details, DreamBook Power X72 Notebook price tag, DreamBook Power X72 Notebook price, DreamBook Power X72 Notebook detailed review, DreamBook Power X72 Notebook preview,Notebook, Pioneer Computers, Pioneer Computers Australia, Pioneer Computers DreamBook Power X72, Powerful Notebook, Six-Core CPU notebook. is pioneer computer a reliable company? i've never heard of it? how about after sales service and warranty? Yes friend one of the top companies search in google for more details and its an Australian PC manufacturer.